Data from the Bank of Greece for March shows net Target2 liability for Greece increased by another €5.27 billion in March to €96.427 billion. 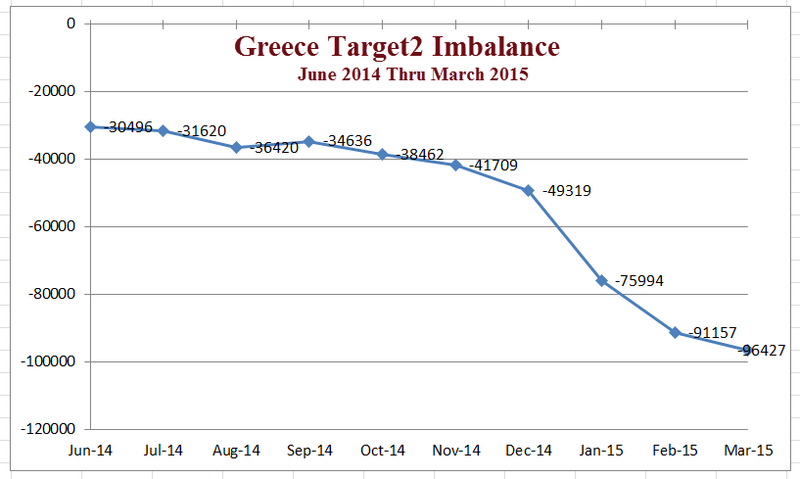 Target2 represents capital flight from Greece. Data for the chart is from Eurocrisis Monitor, with my update reflecting the latest data from the Bank of Greece. The pace has slowed, but the trend is clear. 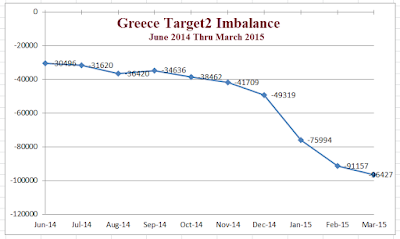 Capital flight from Greece continues. For a refresher course on Target2, please see Reader From Europe Asks "Can You Please Explain Target2?" Eurozone exposure to Greek liabilities is €96.427 billion of Target2 imbalances plus another €14.028 billion net liabilities related to the allocation of euro banknotes. Thanks to reader Lars who has been following these imbalances. Net liabilities to euro banknotes was about €13 billion last month and €10 billion at the end of 2014. Yesterday at a press conference Lars informs me Draghi mentioned Eurozone exposure to Greek liabilities was €110. One can arrive at that number by adding €96 and €14.